"HDMiniCam" You can download it from Apple APP Store or Google Play or scan the QR code on the package. 1. One mobile device can connect 8 cameras at the same time. 2. Can work on android and IOS system,PC ,MAC or the other devices. (except windows phone). 3.Supports Only 2.4G Wifi Network, Not Support 5G Wifi. Way 1 : Recording on Micro SD card , choose "All Day" or "On Alarm". Way 2 : P2P Connection: when smartphone near to this Tiny Camera, connect to the camera WIFI signal named "CM..." appears on your devices WIFI list. Way 3 : Wifi connection: you can control it from anywhere on your smart phone when this hidden camera system connected to your wifi. The newest chip wireless solution brings uninterrupted, stable WIFI connection. True HD 1280x720P,Bring picture quality and high-definition video. This spy camera's WiFi effective distance is about 30m, allowing you to place your wireless camera at will. Very small lens, so you can easily hide it without being noticed. When motion is detected, mini spy camera will start recording automatically. 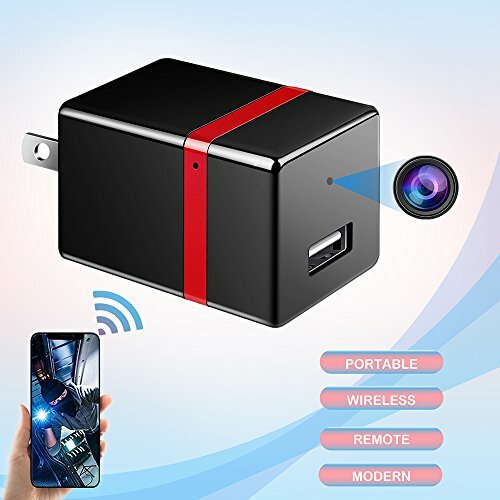 【Camera Spy】Perfect Design Spy Camera Hidden Camera Wifi for Home Security: This full HD 1080P WiFi camera charger is concealed in what looks like a normal adapter. You can plug in this spy camera hidden camera IP camera everywhere and it is totally not noticeable while the camera is recording. 【Spy Camera Wireless Hidden】This hidden security camera doesn't require special set up, you can control it from anywhere on your phones with Internet access. Even if there is no Internet access, you can insert micro SD card into nanny cam, it also can function automatically. 【2 Years Manufacturer Warranty】Thank you for your consideration of our IELEACC Spy Camera System ! We have done extensive testing on this new model and we truly believe this Mini wireless hidden spy IP usb charger camera with night vision and motion detection will be the best product on market for your home security. If you have any questions about this product by ieleacc, contact us by completing and submitting the form below. If you are looking for a specif part number, please include it with your message.